One of the aims of my summer sewing push is to put my fabric stash to good use, and after finishing my in June, I had quite a bit of fabric left over. 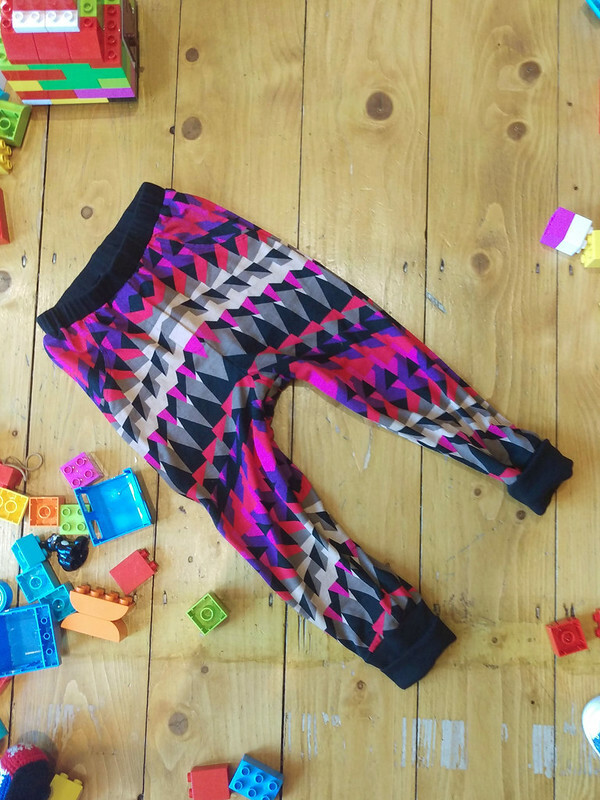 It’s such a lovely, soft jersey, and in such a vibrant print, perfect for baby clothes! Browsing the usual pattern sources didn’t yield anything I liked (why all the frills? seriously). 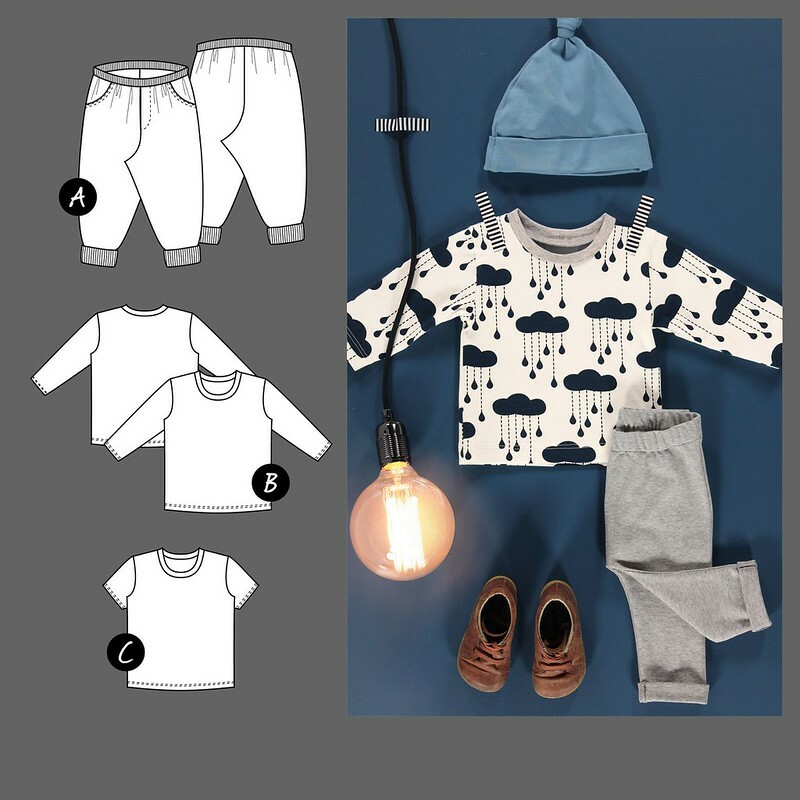 I’m not sure how I found it but I chanced upon Danish brand Stoff & Stil, who have a whole range of designs for easy, practical basics for babies and children – exactly what I’m after! I picked out this basic Trousers and T Shirt pattern from their babies and newborn section, which goes up to 2 years. There are a few things that are a bit different about Stoff & Stil patterns which are worth keeping in mind. Firstly, they’re pre-cut in the chosen size. I was a bit disappointed not to be able to buy a pattern that could grown with my daughter, but this saves a bit of time and is offset by the very reasonable price of £3.75 for three garments. 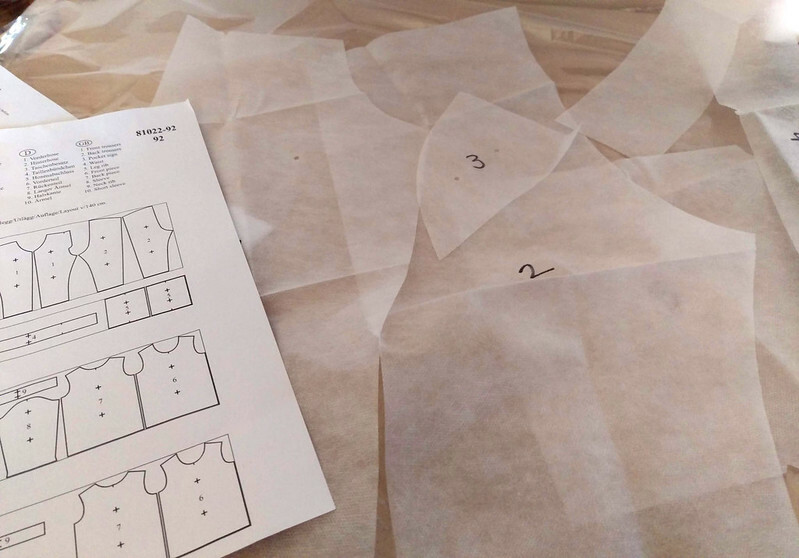 It does however put me off buying an adult garment pattern, for which I appreciate having the grading lines so I can fine-tune the fit. Secondly, the pattern pieces are an interfacing type material, and have no printed markings (I added the numbers myself). There are a few notches, and each piece has two punched dots indicating the grainline, but don’t expect anything else. Pay close attention to the seam allowance specified in the instructions! There won’t be anything on your pieces to remind you where to sew. Lastly, the instructions are minimal – just a few bullet points. Unlike the paper patterns I’m used to, which often seem over-complicated and make me wonder “where are they going with this?”, this pattern relied a lot on common sense. Also, maybe a bit of experience to get a good finish. There were a few tricky bits, like sewing the curve of the faux pockets, and managing the gather of the elasticated waistband, which took me a couple of attempts and I think would be difficult for a beginner to execute well. Just as with my top in the same fabric, I took great care to line up the bold print with the pattern pieces. The result is great! Being my second project with stretch knits I accepted that the finish on the inside may not be perfect. This is an unorthodox way to finish knit fabric, but I decided to tape the leg and crotch seams. Zig-zagging this fabric with my equipment is not an option, and also, I didn’t want rough edges chafing delicate skin. Luckily, this turned out really rather well, but not for the waist and ankle seams, where the ribbing added more bulk. To my great surprise, the ribbing did tolerate finishing with zig-zag, and had a lot more stability than the main fabric. All things considered, I’d say that it is possible to get a good finish (at least on the outside) with knits, and even stretch knits, with a regular sewing machine (even mine, which was not in a happy state). The faux pockets have a double row of topstitching, which I did by eye (I didn’t feel like pushing my luck after the last double-needle incident), and I even this looks look good! The poor machine has now gone for a long-overdue service. In all honesty I was pushing my luck continue using it for the last two projects done because it’s not been running smoothly and is noticeably off-centre. The cotton ribbing I used for the waistband and cuffs was also from Stoff & Stil, who stock a really amazing range of ribbing, which, for whatever reason is hard to find in UK shops. Their range includes organic cotton, stripes and practically every colour under the sun, to coordinate with their super range of jerseys. I must own up, I had a little decluttering fail and ordered quite a bit of other fabric from Stoff & Stil. Details of the fabrics can be found in my Textillia stash. If you’re currently decluttering, I strongly advise you avoid Stoff & Stil! 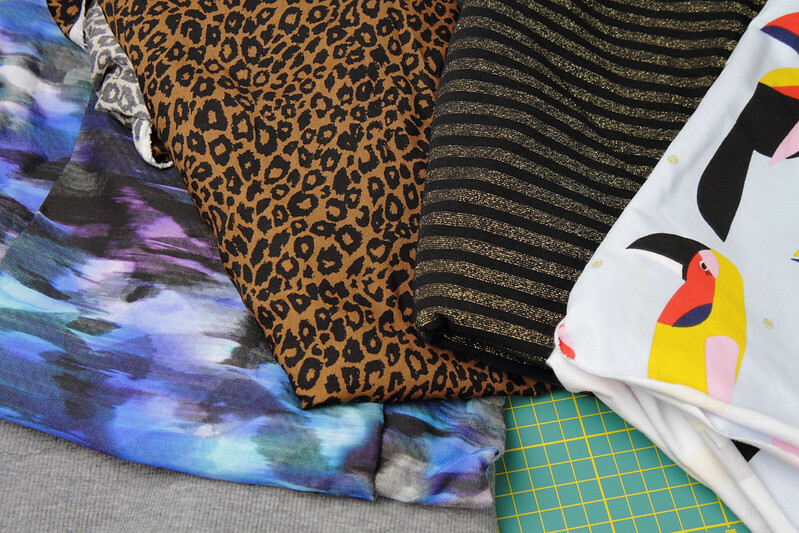 I don’t often see prints that I like enough that I would pick up if I saw them in garment form n a shop, so when I found so many contemporary prints in one place, I got a little carried away. In my defense, I have immediate plans for all of them. The jerseys will be used with this pattern to make more trousers and t shirts for my daughter. Viscose prints were already on my shopping list and have been allocated to dress and skirt projects from patterns in my stash. While my sewing machine is in the sewing machine hospital, I’ve had some time to think about what kind of sewing machine I would like, if I could have any. They say “a dodgy worker blames their tools”, but I think that often, having the wrong tool can hold you back. I recently treated myself to a rotary cutter, large cutting mat and a new set of pins, and even these modest upgrades have sped up my sewing and removed some of the frustration. I’m feeling a bit like that with my sewing machine, that I have found its limits and almost always want to go beyond them. It doesn’t do thin fabrics well, nor does it cope with coat fabric (though the repair person thought that it ought to). It jams a lot and has terrible tension, and these things slow me down. A new sewing machine is something I now see in my future. Having spend a couple of weeks researching, I think I have found the right one and unsurprisingly it’s going to be a big investment. In the medium term I will probably acquire an overlocker too, as I am getting a taste for stretch fabrics, and this is what I actually wear most of the time. In short, I will no longer be able to blame my tools!